Step into shearling comfort with these darling Lamb Slippers. Adorned with a subtle smile and a bow, these little lambs are ready to keep your feet warm and comfortable no matter what the weather's like. With a thick and sturdy rubber sole, you might even be tempted to wear these everywhere you go. 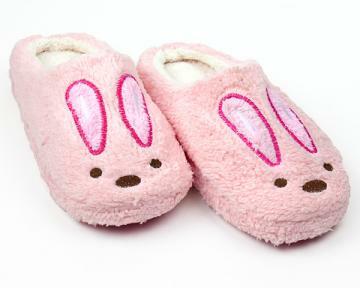 A moccasin-style slippers, these Lambs are lined with plush faux shearling to provide you with a soft and cozy feel. 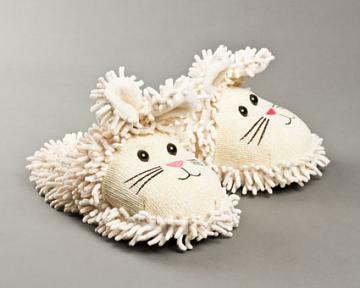 Pad around in comfort with our adorable Lamb Slippers! Adorable!!! Bought them for my mom and she LOVES them! Wasn’t sure if they would fit, but customer service got back to me right away - and they do!!! I love the little lamb slippers. They are SO soft and comfortable. The thick rubber sole is wonderful. I purchased them as a gift for a young lady that loves lambs/sheep, but now I want my own pair! I love them. This is the second pair I've had. I wore the first pair out! !